Residents of Opelika eagerly dove into a citywide charrette called DesignPlace. One result morphed from sticky notes, through local history, into a logo with locomotion. When Leigh Krehling became community relations officer for the City of Opelika two years ago, one of her first priorities was to update the logo and branding for the east Alabama city that over the past few years has reinvented itself. “It was time for us to maybe get a more progressive look and get into this century, as far as all of our information,” she says. That coincided with Opelika working with DesignPlace — a program of the nonprofit DesignAlabama — which sends in a team of designers to help a small town with design, planning and community identity assistance. “They were great to work with and spent quite a bit of time with our people,” Krehling says. The people — through a series of community meetings — spoke loudly. 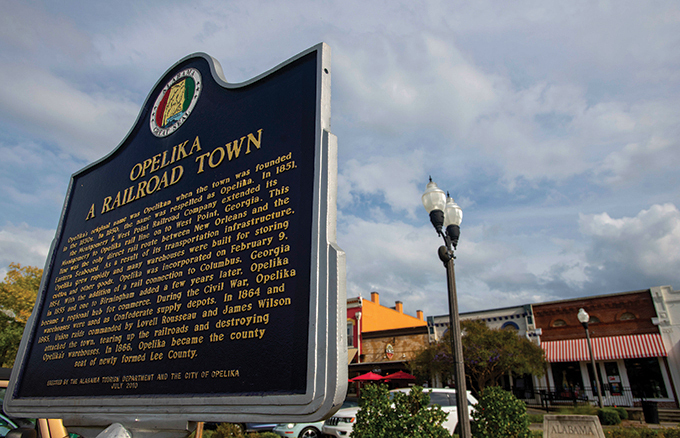 They wanted Opelika’s new branding to incorporate its history as a railroad town. The momentum of that message is Opelika’s reliance on and fascination with trains, which goes back more than 150 years. Opelika first became an important Alabama railway hub in the 1850s, when the Montgomery and West Point Railroad opened a line that went through the town. Not only was it important to cotton farmers in the state, but it also was an important transport tool during the Civil War. That 2018 film tells the story of the Rocky Brook Rocket, a miniature train running through Opelika’s Municipal Park. It was front-page news when civic leaders put the money together to buy it in 1955. Recently restored, it’s still giving children a taste of riding the rails. Big trains still run through town daily, too, and much of Opelika’s recent revival features breweries, restaurants, galleries, festivals and other things that have sprouted around the city’s downtown depot and railroad tracks. All of that train history came into play as DesignAlabama brought its DesignPlace team to Opelika two years ago. A couple of years before that, Opelika Mayor Gary Fuller had attended one of DesignAlabama’s design summits. By the way, its 13th summit will be in February, and a mayor must attend for his or her town to qualify for DesignPlace. “We bring in five mayors from a region in the state to talk about planning or design issues they have, and at that time Mayor Fuller was focused” on revitalizing two of Opelika’s neighborhoods, says Gina Clifford, executive director of DesignAlabama. Her group focuses on all aspects of design, including architecture, engineering, graphic design, industrial design, interior design, landscape architecture and urban design. DesignPlace, a 2-year-old initiative of DesignAlabama, sprang out of the need for a “next step” for those who attended the mayors’ summit, and Opelika was chosen to be the first community for DesignPlace. That’s when Stiff and Copperwing came into town to work with Krehling, who was new to her job as community relations officer and was pleased to know the City of Opelika was already in the early stages of the rebranding process. Eventually, taking things DesignPlace had heard from across the city and ideas from other brainstorming sessions, two major themes bubbled to the surface — Opelika’s lifestyle and its people. “Out of that came out that a lot of history is still important, and we wanted to keep that and maintain that as part of the brand,” Krehling says. Stiff and Copperwing went to work, trying to incorporate what they learned from the community into typography that Krehling had already designed. The result is a distinctive, modern “O” mark that also incorporates railroad tracks, a nod to both Opelika’s present and future, as well as to the railroad history that is so important to its residents. The new logo was approved in January, debuted in March and is already appearing on websites, press releases, signage and other places. It has been a great success from Krehling’s perspective. And because it was a project of DesignAlabama and DesignPlace, the design work itself was free for the city, Krehling adds. “It would have cost thousands and thousands of dollars to create a new brand story and logo, and we didn’t have to pay anything,” she says. Alec Harvey and Julie Bennett are freelance contributors to Business Alabama. Harvey and Bennett are both based in Auburn.